'Amplify' participants, from left, are Trevor Hampson of Cornwall Bridge, Conn.; Trey Carlisle of Los Angeles, Calif.; Crystal Moore of Lanesborough, Mass. ; Elisabeth Enoch of Monterey, Mass. ; Brianna Nicola of Pittsfield, Mass. ; and Dylan Bell of New Lebanon, N.Y.
Sheffield — On a recent weekday morning, beneath two silently humming ceiling fans, the warm, wooden space within Dewey Hall was brimming with the sounds of communication and collaboration as evidenced by a chorus of voices: “Close your eyes, open your ears, listen to the sound of the music, oh yeah…you can change yourself if you open your mind, oh yeah.” Assembled on a makeshift stage are six singers/musicians, and at the helm is Todd Mack, founder and Executive Director of Music in Common (MIC). “I want you guys to be really light on this,” is Mack’s instruction, made from his vantage point roughly 20 feet away. “You are like a cushion for them,” he tells the musicians, of the trio of vocalists, and then they take it from the top once again. A scant two weeks ago, the six “Amplify”participants were utter strangers, having come together from various corners of the country to converge in a 3-week celebration of music and cultural understanding. To my untrained ear, the group can improvise and harmonize like a band that’s been on the road together for years. They are rehearsing “The Change We’ll Bring” — a song written by Israeli, Palestinian and American students during MIC’s International Youth Summit in the summer of 2014 held at Bard College at Simon’s Rock in Great Barrington — and the experience of listening to this group is chill worthy. “It’s hard for me to think of the ‘Amplify’participants as kids,” Mack remarks. “These talented musicians are studying, learning, and interpreting songs written by peers they have never met. In the process, they are discovering the stories, struggles, hopes, and visions of youth whose lives may be very different from their own,” he added noting that the efforts of this highly motivated group exceed all expectations of talent, commitment, collaboration and professionalism. The participants are: Trevor Hampson, 16, of Cornwall Bridge, Conn.; Trey Carlisle, 19, of Los Angeles, Calif.; Crystal Moore, 15, of Lanesborough, Mass. ; Elisabeth Enoch, 16, of Monterey, Mass. ; Brianna Nicola, 17, of Pittsfield, Mass. ; and Dylan Bell, 16, of New Lebanon, N.Y. 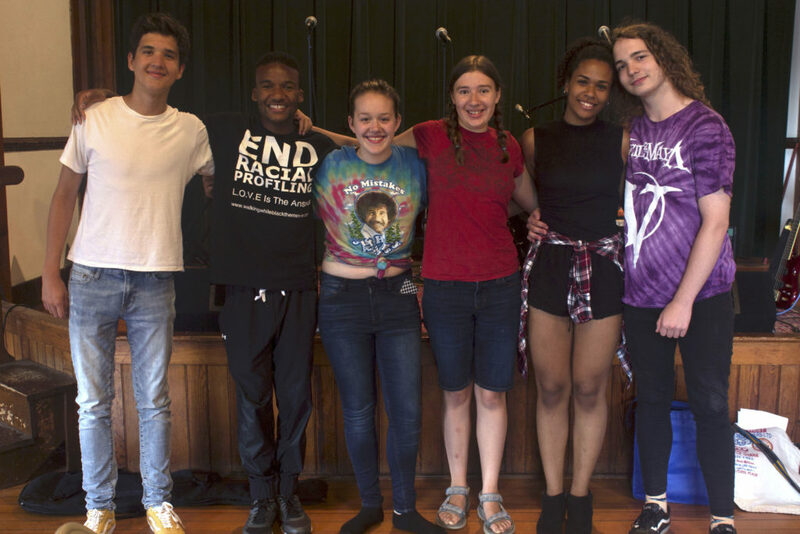 Founded in 2005, Music in Common is a non-profit organization that empowers youth against hate — bringing together teens and young adults from diverse backgrounds to discover and celebrate their common ground through collaborative songwriting and multimedia. It was founded by singer/songwriter Todd Mack to honor his friend and bandmate, Daniel Pearl, the Wall Street Journal reporter abducted and murdered by militants in Pakistan in 2002. Headquartered in the Berkshires, the organization’s programs have brought together Israelis and Palestinians, Christians, Jews and Muslims, as well as native-born Americans and immigrants from Somalia, Bhutan, Syria and Lebanon. By creating original music together, participants wage peace, expand understanding, build confidence, strengthen communities and — yes — change the world. “I fell in love with the program,” said Carlisle who was introduced to MIC two years ago in Southern California. He was invited by Mack to join this summer’s group as a peer mentor. “It’s my passion to use music and dance to promote cross-cultural communication, empathy between different groups,” Carlisle explained. “I love the arts feeling here — it’s very empowering,” he said of his first trip to the Berkshires. Carlisle, a rising junior at Soka University of America in Orange County, will study abroad in China next February — for three months — in hopes of sharing what he has learned as a result of his involvement with MIC. “It’s been an amazing experience,” said Moore. “I love being able to come together with people from my generation to spread positivity and peace that the world really, really needs. It puts us one step closer to helping and healing,” she added. “This program is not like any other,” said Nicola. “Everyone here is amazing. I get surprised by the talent every day, I learn something every day, and I appreciate [all of it].” And as the performance draws near? “There are always nervous jitters,” said Moore. “I like to think of it as my body’s way of reminding me I’m about to do something really cool,” added Carlisle. The “Amplify”musicians have been working to learn, interpret and perform a selection of songs compiled in MIC programs over the past 13 years. “To understand the process the past musicians underwent in writing their songs — before we learn and interpret them — has been really powerful,” said Bell. “The Stories in Our Eyes” was composed by a group of young people living in one of the largest refugee resettlements in the country located in Clarkston, Georgia; “Rehumanize” was composed by Jewish, Christian and Muslim students who came together to observe the 15th anniversary of 9/11. “I am certain that anyone who experiences the concerts on August 26 and August 27 will themselves be transported to the places and communities these songs come from and leave inspired by the words, messages, and voices they hear,” said Mack. On Sunday, August 26 at 7 p.m.Sheffield-based Music in Common will officially launch its Amplify concert, featuring songs written by the organization’s participants from around the world since 2010. The Worldwide Debut of Amplify will take place at Zion Lutheran Church in PIttsfield. Amplify Concert tickets ($15 adults / $12 for students) may be purchased online at www.musicincommon.org/amplify-concert. Tickets purchased at Zion Lutheran Church the day of the concert will be $20 for adults and $15 for students. 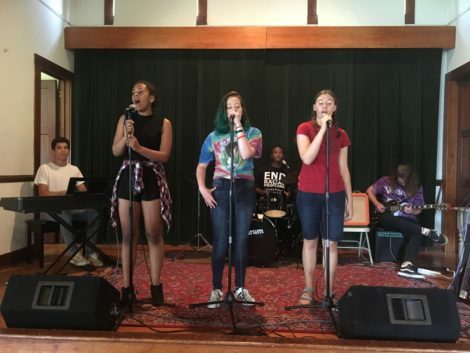 With a mission to strengthen, empower, and connect communities through the universal language of music, Music in Common (MIC) produces dozens of youth programs and concert events each year in communities around the country and across the globe. These experiences give voice to their collective visions on relevant social or cultural issues. With the generous support of donors, grants, Raise the MIC artists and sponsors, most programs are tuition-free for participants. Both events are sponsored in part by Greylock Federal Credit Union, Dewey Hall, and the Cornwall Inn.